Previous accounts of Marx’s life have gone one of two ways. Either he is seen as a prophet of modern times, a seer whose theories help us understand the predicament we are in, especially in times of economic crisis, an inspiration to everyone who wishes to see state and society emancipated and transformed. Or, alternatively, he was a misguided and misguiding ideologue whose theories have been responsible for some of the worst crimes of the 20th century. This book aims to scrape away the patina of retrospective polemic to reveal Marx in the context of his own times. I’m only on page 153 now, in early 1845—the Prussian government just convinced the French to expel Marx from Paris, and he’s in the process of reestablishing his household and his journalism in Brussels—but the book is amply living up to Evans’s recommendation; I’m looking forward to continuing with it. But Darwin’s German was nothing to write home about, and most of the pages of the copy of Das Kapital in his library are uncut. So it’s not surprising that, having debunked the myth about the dedication, Sperber didn’t bother to mention the correspondence; it isn’t really important for understanding either Darwin or Marx. I can’t claim any tremendous expertise on Marx, but Sperber’s treatment of his relationship with Darwin looks to be judicious. On the one hand, Marx was quick to accept the science. He acquired a copy of the Origin within two weeks of its original publication in November 1859, and told his friend and collaborator Friedrich Engels that it was “just terrific.” Thereafter, he avidly read books and attended lectures about evolution. 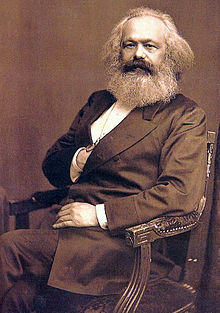 On the other hand, a lot of Marx’s interest in Darwin was due to his regarding it as useful in promoting his own views. Of the Origin, he told Engels, “Although developed in a crude English way, this is the book that contains the basis for our views in natural history.” Later, he decided that it was not as useful as rival views, although he continued to prize it for what he viewed as its usefulness in mounting a case for materialism and atheism. In his discussion, Sperber vividly illustrates where Marx’s priorities lay. Marx preferred Pierre Trémaux’s view of evolution (in Origine et transformations de l’homme et des autres êtres ) to Darwin’s, in part because, as he wrote, “Progress, which in Darwin is purely accidental, is here necessary on the basis of the periods of development of the body of the earth.” Marx thus understood that Darwin’s view was not committed to the idea of evolutionary progress. Yet when Engels was publicizing Das Kapital in the German press, Marx suggested that he describe his work as the social equivalent of Darwin’s, both manifestations of “the liberal doctrine of ‘progress’”—even though he knew better, he was still not reluctant to endorse a popular misconception of Darwin’s view in order to bask in its reflected prestige. Kapitalizing on Darwin, as it were. When Marx was laid to rest in Highgate Cemetery in London in March 1893, Engels compared him with Darwin in his famous funeral oration, saying, “Just as Darwin discovered the law of development of organic nature, so Marx discovered the law of development of human history.” A further reminder of Darwin was among the handful of mourners, which included “two friends Marx had met through Engels in Manchester, both scientists.” One was the chemist Carl Schorlemmer; the other was E. Ray Lankester. Born in 1847, Lankester was one of the leaders of British biology in the first generation after Darwin, whom he met as a child and corresponded with in the 1870s and 1880s. In one letter to him, Darwin expresses his shared admiration for Herbert Spencer—whose ashes, as it happens, are interred in Highgate, across from Marx’s grave. Small world!